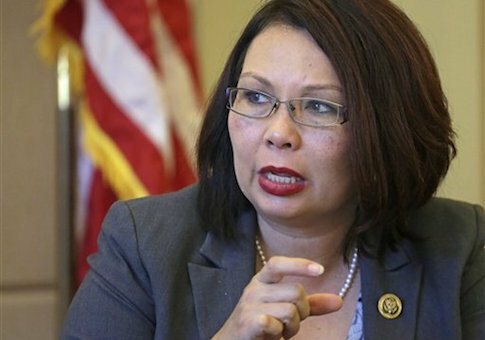 Rep. Tammy Duckworth will head to court next month after two women who filed a workplace retaliation lawsuit against the Illinois Democrat rejected a settlement offer that was initially reported a certainty. The announcement arrived the day before Duckworth, who is campaigning to unseat Republican Sen. Mark Kirk, is set to deliver a highly anticipated speech at the Democratic National Convention in Philadelphia. Plaintiffs Denise Goins and Christine Butler told the Daily Herald Wednesday that they decided to refuse the settlement offer after Duckworth’s deputy campaign manager Matt McGrath called the lawsuit a "frivolous workplace case" that has been ongoing for more than eight years. Butler said Duckworth’s campaign "decided to swing us through the mud again" just an hour after leaving the courthouse to discuss a settlement deal. Butler said she and Goins emailed their attorney to request that the case proceed to trial. The case was brought in 2007 while Duckworth was heading the Illinois Department of Veterans’ Affairs. Goins and Butler, who both worked at the Anna Veterans Home, filed ethics complaints against Duckworth at the time. Butler charged that Duckworth fired her for being "insubordinate." Goins accused the senator of commanding, "If you do your job and keep your mouth shut and concentrate on job duties, you will keep your job" the same day as Butler’s firing. The plaintiffs rejected the idea that they cooperated with Kirk’s campaign when they refused the settlement offer. "We are both nonpolitical people. When we initiated the very first formal complaint, we had no idea she had political aspirations," Butler told the Daily Herald. "We would have been happy to be done with it years ago." This entry was posted in Politics and tagged 2016 Election, Mark Kirk, Tammy Duckworth. Bookmark the permalink.